An armoured fighting vehicle (AFV) is an armed combat vehicle protected by armour, generally combining operational mobility with offensive and defensive capabilities. AFVs can be wheeled or tracked. Main battle tanks, armoured cars, armoured self-propelled guns, and armoured personnel carriers are all examples of AFVs. Armoured fighting vehicles are classified according to their intended role on the battlefield and characteristics. The classifications are not absolute; two countries may classify the same vehicle differently, and the criteria change over time. For example, relatively lightly armed armoured personnel carriers were largely superseded by infantry fighting vehicles with much heavier armament in a similar role. Successful designs are often adapted to a wide variety of applications. For example, the MOWAG Piranha, originally designed as an APC, has been adapted to fill numerous roles such as a mortar carrier, infantry fighting vehicle, and assault gun. The concept of a highly mobile and protected fighting unit has been around for centuries; from Hannibal's war elephants to Leonardo's contraptions, military strategists endeavoured to maximize the mobility and survivability of their soldiers. Armoured fighting vehicles were not possible until internal combustion engines of sufficient power became available at the start of the 20th century. Modern armoured fighting vehicles represent the realization of an ancient concept - that of providing troops with mobile protection and firepower. Armies have deployed war machines and cavalries with rudimentary armour in battle for millennia. Use of these animals and engineering designs sought to achieve a balance between the conflicting paradoxical needs of mobility, firepower and protection. Siege engines, such as battering rams and siege towers, would often be armoured in order to protect their crews from enemy action. Polyidus of Thessaly developed a very large movable siege tower, the helepolis, as early as 340 BC, and Greek forces used such structures in the Siege of Rhodes (305 BC). The idea of a protected fighting vehicle has been known since antiquity. 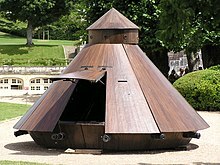 Frequently cited is Leonardo da Vinci's 15th-century sketch of a mobile, protected gun-platform; the drawings show a conical, wooden shelter with apertures for cannons around the circumference. The machine was to be mounted on four wheels which would be turned by the crew through a system of hand cranks and cage (or "lantern") gears. Leonardo claimed: "I will build armored wagons which will be safe and invulnerable to enemy attacks. There will be no obstacle which it cannot overcome." Modern replicas have demonstrated that the human crew would have been able to move it over only short distances. Hussite forces in Bohemia developed war wagons - medieval weapon-platforms - around 1420 during the Hussite Wars. These heavy wagons were given protective sides with firing slits; their heavy firepower came from either a cannon or from a force of hand-gunners and crossbowmen, supported by infantry using pikes and flails. Heavy arquebuses mounted on wagons were called arquebus à croc. These carried a ball of about 3.5 ounces (100 g). The first modern AFVs were armed cars, dating back virtually to the invention of the motor car. The British inventor F.R. 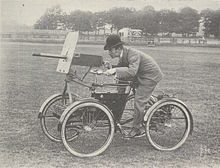 Simms designed and built the Motor Scout in 1898. It was the first armed, petrol-engine powered vehicle ever built. It consisted of a De Dion-Bouton quadricycle with a Maxim machine gun mounted on the front bar. An iron shield offered some protection for the driver from the front, but it lacked all-around protective armour. The armoured car was the first modern fully armoured fighting vehicle. The first of these was the Simms' Motor War Car, designed by Simms and built by Vickers, Sons & Maxim in 1899. The vehicle had Vickers armour 6 mm thick and was powered by a four-cylinder 3.3-litre 16 hp Cannstatt Daimler engine giving it a maximum speed of around 9 miles per hour (14 kilometres per hour). The armament, consisting of two Maxim guns, was carried in two turrets with 360° traverse. Another early armoured car of the period was the French Charron, Girardot et Voigt 1902, presented at the Salon de l'Automobile et du cycle in Brussels, on 8 March 1902. The vehicle was equipped with a Hotchkiss machine gun, and with 7 mm armour for the gunner. Armoured cars were first used in large numbers on both sides during World War I as scouting vehicles. In 1903, H. G. Wells published the short story "The Land Ironclads," positing indomitable war machines that would bring a new age of land warfare, the way steam-powered ironclad warships had ended the age of sail. Wells' literary vision was realized in 1916, when, amidst the pyrrhic standstill of the Great War, the British Landships Committee, deployed revolutionary armoured vehicles to break the stalemate. The tank was envisioned[by whom?] as an armoured machine that could cross ground under fire from machine guns and reply with its own mounted machine guns and cannons. These first British heavy tanks of World War I moved on caterpillar tracks that had substantially lower ground pressure than wheeled vehicles, enabling them to pass the muddy, pocked terrain and slit trenches of the Battle of the Somme. The tank eventually proved highly successful and, as technology improved. it became a weapon that could cross large distances at much higher speeds than supporting infantry and artillery. The need to provide the units that would fight alongside the tank led to the development of a wide range of specialised AFVs, especially during the Second World War (1939-1945). 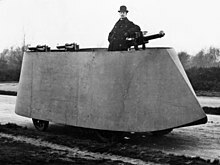 The Armoured personnel carrier, designed to transport infantry troops to the frontline, emerged towards the end of World War I. During the first actions with tanks, it had become clear that close contact with infantry was essential in order to secure ground won by the tanks. Troops on foot were vulnerable to enemy fire, but they could not be transported in the tank because of the intense heat and noxious atmosphere. In 1917, Lieutenant G.R. Rackham was ordered to design an armoured vehicle that could fight and carry troops or supplies. The Mark IX tank was built by Armstrong, Whitworth & Co., although just three vehicles had been finished at the time of the Armistice in November 1918, and only 34 were built in total. Different tank classifications emerged in the interwar period. The tankette was conceived[by whom?] as a mobile, two-man model, mainly intended for reconnaissance. In 1925, Sir John Carden and Vivian Loyd produced the first such design – the Carden Loyd tankette. 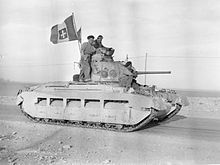 Tankettes saw use in the Italian Royal Army during the Italian invasion of Ethiopia (1935-1936), the Spanish Civil War (1936-1939), and almost everywhere Italian soldiers fought during World War II. The Imperial Japanese Army used tankettes for jungle warfare. The British Gun Carrier Mark I, the first Self-propelled artillery, was fielded in 1917. It was based on the first tank, the British Mark I, and carried a heavy field-gun. The next major advance was the Birch gun (1925), developed for the motorised warfare experimental brigade (the Experimental Mechanized Force). This mounted a field gun, capable of the usual artillery trajectories, on a tank-style chassis. During World War II, most major military powers developed self-propelled artillery vehicles. These had guns mounted on a tracked chassis (often that of an obsolete or superseded tank) and provided an armoured superstructure to protect the gun and its crew. The first British design, "Bishop", carried the 25 pdr gun-howitzer, but in a mounting that severely limited the gun's performance. It was replaced by the more effective Sexton. The Germans built many lightly armored self-propelled anti-tank guns using captured French equipment (for example Marder I), their own obsolete light tank chassis (Marder II), or ex-Czech chassis (Marder III). These led to better-protected tank destroyers, built on a medium-tank chassis such as the Jagdpanzer IV or the Jagdpanther. The Self-propelled anti-aircraft weapon debuted in WWI. The German 88 mm anti-aircraft gun was truck-mounted and used to great effect against British tanks, and the British QF 3 inch 20 cwt was mounted on trucks for use on the Western Front. Although the Birch gun was a general purpose artillery piece on an armoured tracked chassis, it was capable of elevation for anti-aircraft use. Vickers Armstrong developed one of the first SPAAGs based on the chassis of the Mk.E 6-ton light tank/Dragon Medium Mark IV tractor, mounting a Vickers QF-1 "Pom-Pom" gun of 40 mm. The Germans fielded the Sd.Kfz. 10/4 and 6/2, cargo halftracks mounting single 20 mm or 37 mm AA guns (respectively) by the start of the War. 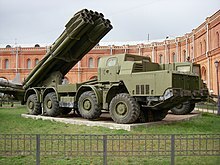 Rocket launchers such as the Soviet Katyusha originated in the late 1930s. The Wehrmacht fielded self-propelled rocket artillery in World War II - the Panzerwerfer and Wurfrahmen 40 equipped half-track armoured fighting vehicles. By the end of World War II, most modern armies had vehicles to carry infantry, artillery and anti-aircraft weaponry. Most modern AFVs are superficially similar in design to their World War II counterparts, but with significantly better armour, weapons, engines, electronics, and suspension. The increase in the capacity of transport aircraft makes possible and practicable the transport of AFVs by air. Many armies are replacing some or all of their traditional heavy vehicles with lighter airmobile versions, often with wheels instead of tracks. The level of armour protection between AFVs varies greatly – a main battle tank will normally be designed to take hits from other tank guns and anti-tank missiles, whilst light reconnaissance vehicles are often only armoured "just in case". Whilst heavier armour provides better protection, it makes vehicles less mobile (for a given engine power), limits its air-transportability, increases cost, uses more fuel and may limit the places it can go – for example, many bridges may be unable to support the weight of a main battle tank. A trend toward composite armour is taking the place of steel – composites are stronger for a given weight, allowing the tank to be lighter for the same protection as steel armour, or better protected for the same weight. Armour is being supplemented with active protection systems on a number of vehicles, allowing the AFV to protect itself from incoming projectiles. The greater the recoil of the weapon on an AFV, the larger the turret ring needs to be. A larger turret ring necessitates a larger vehicle. 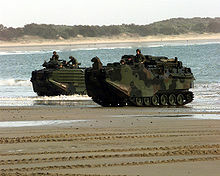 To avoid listing to the side, turrets on amphibious vehicles are usually located at the centre of the vehicle. Modern AFVs have primarily used either petrol (gasoline) or diesel piston engines. More recently, gas turbines have been used. Most early AFVs used petrol engines, as they offer a good power-to-weight ratio. However, they fell out of favour during World War II due to the flammability of the fuel. Most current AFVs are powered by a diesel engine; modern technology, including the use of turbo-charging, helps to overcome the lower power-to-weight ratio of diesel engines compared to petrol. Gas turbine (turboshaft) engines offer a very high power-to-weight ratio and were starting to find favour in the late 20th century – however, they offer very poor fuel consumption and as such some armies are switching from gas turbines back to diesel engines (i.e. the Russian T-80 used a gas turbine engine, whereas the later T-90 does not). The US M1 Abrams is a notable example of a gas turbine powered tank. The tank is an all terrain AFV designed to fill almost all battlefield roles and to engage enemy forces by the use of direct fire in the frontal assault role. Though several configurations have been tried, particularly in the early experimental "golden days" of tank development, a standard, mature design configuration has since emerged to a generally accepted pattern. This features a main tank gun or artillery gun, mounted in a fully rotating turret atop a tracked automotive hull, with various additional secondary weapon systems throughout. Philosophically, the tank is, by its very nature, an offensive weapon. Being a protective encasement with at least one gun position, it is essentially a pillbox or small fortress (though these are static fortifications of a purely defensive nature) that can move toward the enemy – hence its offensive utility. Psychologically, the tank is a force multiplier that has a positive morale effect on the infantry it accompanies. It also instills fear in the opposing force who can often hear and even feel their arrival. Tanks were classified either by size or by role. Classification by relative size was common, as this also tended to influence the tanks' role. Light tanks are smaller tanks with thinner armour and lower-powered guns, allowing for better tactical mobility and ease of strategic transport. These are intended for armoured reconnaissance, skirmishing, artillery observation, expeditionary warfare and supplementing airborne or naval landings. Light tanks are typically cheaper to build and maintain, but fare poorly against heavier tanks. They may be held in reserve for exploiting any breakthroughs in enemy lines, with the goal of disrupting communications and supply lines. Medium tanks are mid-sized tanks with adequate armour and guns, and fair mobility, allowing for a balance of fighting abilities, mobility, cost, and transportability. Heavy tanks are larger tanks with thick armour and more powerful guns, but less mobile and more difficult to transport. They were intended to be more than a match for typical enemy medium tanks, easily penetrating their armour while being much less susceptible to their attacks. Heavy tanks cost more to both build and maintain. Over time, tanks tended to be designed with heavier armour and weapons, increasing the weight of all tanks, so these classifications are relative to the average for the nation's tanks for any given period. An older tank design might be reclassified over time, such as a tank being first deployed as a medium tank, but in later years relegated to light tank roles. Tanks were also classified by roles that were independent of size, such as cavalry tank, cruiser tank, fast tank, infantry tank, tank destroyer, "assault" tank, or "breakthrough" tank. Military theorists initially tended to assign tanks to traditional military infantry, cavalry, and artillery roles, but later developed more specialized roles unique to tanks. In modern use, the heavy tank has fallen out of favour, being supplanted by more heavily armed and armoured descendant of the medium tanks – the universal main battle tank. The light tank has, in many armies, lost favour to cheaper, faster, lighter armoured cars; however, light tanks (or similar vehicles with other names) are still in service with a number of forces as reconnaissance vehicles, most notably the Russian Marines with the PT-76, the British Army with the Scimitar, and the Chinese Army with the Type 63. Modern main battle tanks or "universal tanks" incorporate recent advances in automotive, artillery, armour, and electronic technology to combine the best characteristics of the historic medium and heavy tanks into a single, all around type. They are also the most expensive to mass-produce. A main battle tank is distinguished by its high level of firepower, mobility and armour protection relative to other vehicles of its era. It can cross comparatively rough terrain at high speeds, but its heavy-dependency on fuel, maintenance, and ammunition makes it logistically demanding. It has the heaviest armour of any AFVs on the battlefield, and carries a powerful precision-guided munition weapon systems that may be able to engage a wide variety of both ground targets and air targets. Despite significant advances in anti-tank warfare, it still remains the most versatile and fearsome land-based weapon-systems of the 21st-century, valued for its shock action and high survivability. A tankette is a tracked armed and armoured vehicle resembling a small "ultra-light tank" or "super-light tank" roughly the size of a car, mainly intended for light infantry support or scouting. They were one or two-man vehicles armed with a machine gun. Colloquially it may also simply mean a "small tank". The term "super-heavy tank" has been used to describe armoured fighting vehicles of extreme size, generally over 75 tonnes. Programs have been initiated on several occasions with the aim of creating an invincible siegeworks/breakthrough vehicle for penetrating enemy formations and fortifications without fear of being destroyed in combat. Examples were designed in World War I and World War II (such as the Panzer VIII Maus), along with a few in the Cold War. However, few working prototypes were built and there are no clear evidence any of these vehicles saw combat, as their immense size would have made most designs impractical. A flame tank is an otherwise-standard tank equipped with a flamethrower, most commonly used to supplement combined arms attacks against fortifications, confined spaces, or other obstacles. 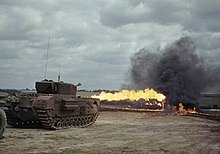 The type only reached significant use in the Second World War, during which the United States, Soviet Union, Germany, Italy, Japan and the United Kingdom (including members of the British Commonwealth) all produced flamethrower-equipped tanks. Usually, the flame projector replaced one of the tank's machineguns, however, some flame projectors replaced the tank's main gun. Fuel for the flame weapon was generally carried inside the tank, although a few designs mounted the fuel externally, such as the armoured trailer used on the Churchill Crocodile. The idea for this tank was developed during World War I by British and French. The infantry tank was designed to work in concert with infantry in the assault, moving mostly at a walking pace, and carrying heavy armour to survive defensive fire. Its main purpose was to suppress enemy fire, crush obstacles such as barbed-wire entanglements, and protect the infantry on their advance into and through enemy lines by giving mobile overwatch and cover. The French Renault FT was the first iteration of this concept. The British and French retained the concept between the wars and into the Second World War era. Because infantry tanks did not need to be fast, they could carry heavy armour. One of the best-known infantry tanks was the Matilda II of World War II. Other examples include the French R-35, the British Valentine, and the British Churchill. A cruiser tank, or cavalry tank, was designed to move fast and exploit penetrations of the enemy front. The idea originated in "Plan 1919", a British plan to break the trench deadlock of World War I in part via the use of high-speed tanks. The first cruiser tank was the British Whippet. Between the wars, this concept was implemented in the "fast tanks" pioneered by J. Walter Christie. These led to the Soviet BT tank series and the British cruiser tank series. During World War II, British cruiser tanks were designed to complement infantry tanks, exploiting gains made by the latter to attack and disrupt the enemy rear areas. In order to give them the required speed, cruiser designs sacrificed armour and armament compared to the infantry tanks. Pure British cruisers were generally replaced by more capable medium tanks such as the US Sherman and, to a lesser extent, the Cromwell by 1943. Some multi-axled wheeled fighting vehicles can be quite heavy, and superior to older or smaller tanks in terms of armour and armament. Others are often used in military marches and processions, or for the escorting of important figures. Under peacetime conditions, they form an essential part of most standing armies. Armoured car units can move without the assistance of transporters and cover great distances with fewer logistical problems than tracked vehicles. A scout car is a military armored reconnaissance vehicle, capable of off-road mobility and often carrying mounted weapons such as machine guns for offensive capabilities and crew protection. They often only carry an operational crew aboard, which differentiates them from wheeled armored personnel carriers (APCs) and Infantry Mobility Vehicles (IMVs), but early scout cars, such as the open-topped US M3 Scout Car could carry a crew of seven. The term is often used synonymously with the more general term armored car, which also includes armored civilian vehicles. They are also differentiated by being designed and built for purpose, as opposed to improvised "technicals" which might serve in the same role. An internal security vehicle (ISV), also known as an armoured security vehicle (ASV), is a combat vehicle used for suppressing civilian unrest. Security vehicles are typically armed with a turreted heavy machine gun and auxiliary medium machine gun. The vehicle is designed to minimize firepower dead space and the vehicles weapons can be depressed to a maximum of 12°. Non-lethal water cannons and tear gas cannons can provide suppressive fire in lieu of unnecessary deadly fire. Improvised armoured truck in 1916, during the Easter Rising. Armoured personnel carriers (APCs) are intended to carry infantry quickly and relatively safely to the point where they are deployed. In the Battle of Amiens, 8 August 1918, the British Mk V* (Mark Five Star) tank carried a small number of machine gunners as an experiment, but the men were debilitated by the conditions inside the vehicle. Later that year the first purpose-built APC, the British Mk IX (Mark Nine), appeared. 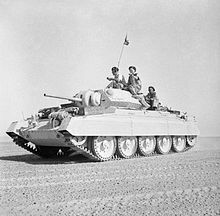 In 1944, the Canadian general Guy Simonds ordered the conversion of redundant armoured vehicles to carry troops (generically named "Kangaroos"). This proved highly successful, even without training, and the concept was widely used in the 21st Army Group. Post-war, specialised designs were built, such as the Soviet BTR-60 and US M113. They are typically armed with an autocannon of 20 to 40 mm calibre, 7.62mm machine guns, anti-tank missiles (ATGMs) and/or surface-to-air missiles (SAMs). IFVs are usually tracked, but some wheeled vehicles fall into this category. IFVs are generally less heavily armed and armoured than main battle tanks. They sometimes carry anti-tank missiles to protect and support infantry against armoured threats, such as the NATO TOW missile and Soviet Bastion, which offer a significant threat to tanks. Specially equipped IFVs have taken on some of the roles of light tanks; they are used by reconnaissance organizations, and light IFVs are used by airborne units which must be able to fight without the heavy firepower of tanks. A CV-9035 Swedish infantry fighting vehicle used by U.S. Army. A French Nexter Aravis in Strasbourg. Norwegian soldiers running operations in an Iveco LMV in Faryab province, Afghanistan. The Iveco LMV is widely used by European militaries. An RMMV Survivor R used by the Saxony State Police. In this configuration, it does not feature the .50 machine gun and grenade launcher remote weapon station used in the standard military configuration. Modern engineering AFV's utilize chassis based on main battle tank platforms: these vehicles are as well armoured and protected as tanks, designed to keep up tanks, conduct obstacle breaching operations to help tanks get to wherever it needs to be, perform utility functions necessary to expedite mission objectives of tanks, and to conduct other earth-moving and engineering work on the battlefield. These vehicles go by different names depending upon the country of use or manufacture. In the United States the term "combat engineer vehicle (CEV)" is used, in the United Kingdom the term "Armoured Vehicle Royal Engineers (AVRE)" is used, while in Canada and other commonwealth nations the term "armoured engineer vehicle (AEV)" is used. There is no set template for what such a vehicle will look like, yet likely features include a large dozer blade or mine ploughs, a large calibre demolition cannon, augers, winches, excavator arms and cranes, or lifting booms. Although the term "armoured engineer vehicle" is used specifically to describe these multi-purpose tank-based engineering vehicles, that term is also used more generically in British and Commonwealth militaries to describe all heavy tank-based engineering vehicles used in the support of mechanized forces. Thus, "armoured engineer vehicle" used generically would refer to AEV, AVLB, Assault Breachers, and so on. Good examples of this type of vehicle include the UK Trojan AVRE, the Russian IMR, and the US M728 Combat Engineer Vehicle. A German army Rheinmetall Keiler. It uses a heavy-duty rotor-powered mine flail, which causes mines it comes in contact with to safely detonate. A breaching vehicle is especially designed to clear pathways for troops and other vehicles through minefields and along roadside bombs and Improvised Explosive Devices. These vehicles are equipped with mechanical or other means for the breaching of man made obstacles. 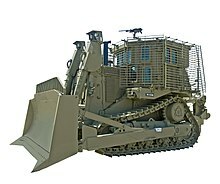 Common types of breaching vehicles include mechanical flails, mine plough vehicles, and mine roller vehicles. The bridge layer unfolds and launches its cargo, providing a ready-made bridge across the obstacle in only minutes. Once the span has been put in place, the AVLB vehicle detaches from the bridge, and moves aside to allow traffic to pass. Once all of the vehicles have crossed, it crosses the bridge itself and reattaches to the bridge on the other side. It then retracts the span ready to move off again. A similar procedure can be employed to allow crossings of small chasms or similar obstructions. AVLBs can carry bridges of 60 feet (18 metres) or greater in length. By using a tank chassis, the bridge layer is able to cover the same terrain as main battle tanks, and the provision of armour allows them to operate even in the face of enemy fire. However, this is not a universal attribute: some exceptionally sturdy 6x6 or 8x8 truck chassis have lent themselves to bridge-layer applications. 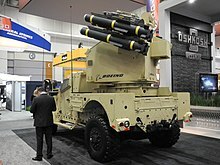 An anti-aircraft vehicle, also known as a self-propelled anti-aircraft weapon (SPAA) or self-propelled air defense system (SPAD), is a mobile vehicle with a dedicated anti-aircraft capability. The Russian equivalent of SPAAG is ZSU (from zenitnaya samokhodnaya ustanovka – "anti-aircraft self-propelled mount"). Specific weapon systems used include machine guns, autocannons, larger guns, or missiles, and some mount both guns and longer-ranged missiles. Platforms used include both trucks and heavier combat vehicles, such as APCs and tanks, which add protection from aircraft, artillery, and small arms fire for front line deployment. Anti-aircraft guns are usually mounted in a quickly traversing turret with a high rate of elevation, for tracking fast-moving aircraft. They are often in dual or quadruple mounts, allowing a high rate of fire. Today, missiles (generally mounted on similar turrets) have largely supplanted anti-aircraft guns. In the past, self-propelled artillery has included direct-fire "Gun Motor Carriage" vehicles, such as assault guns and tank destroyers (also known as self-propelled anti-tank guns). These have been heavily armoured vehicles, the former providing danger-close fire-support for infantry and the latter acting as specialized anti-tank vehicles. The key advantage of self-propelled over towed artillery is that it can be brought into action much faster. Before towed artillery can be used, it has to stop, unlimber and the guns set up. To move position, the guns must be limbered up again and brought — usually towed — to the new location. By comparison, self-propelled artillery in combination with modern communications, can stop at a chosen location and begin firing almost immediately, then quickly move on to a new position. This ability is very useful in a mobile conflict and particularly on the advance. Historically, the custom-built fully armored assault guns usually mounted the gun or howitzer in a fully enclosed casemate on a tank chassis. The use of a casemate instead of a gun turret limited these weapons' field of fire, but allowed a larger gun to be fitted relative to the chassis, more armour to be fitted for the same weight, and provided a cheaper construction. In most cases, these turretless vehicles also presented a lower profile as a target for the enemy. A mortar carrier is a self-propelled artillery vehicle carrying a mortar as its primary weapon. Mortar carriers cannot be fired while on the move and some must be dismounted to fire. In U.S. Army doctrine, mortar carriers provide close and immediate indirect fire support for maneuver units while allowing for rapid displacement and quick reaction to the tactical situation. The ability to relocate not only allows fire support to be provided where it is needed faster, but also allows these units to avoid counter-battery fire. Mortar carriers have traditionally avoided direct contact with the enemy. Many units report never using secondary weapons in combat. The railroad cars on an armoured train were designed for many tasks, such as carrying guns and machine guns, infantry units, anti-aircraft guns. During World War II, the Germans would sometimes put a Fremdgerät (such as a captured French Somua S-35 or Czech PzKpfw 38(t) light tank, or Panzer II light tank) on a flatbed car, which could be quickly offloaded by means of a ramp and used away from the range of the main railway line to chase down enemy partisans. Armoured trains were sometimes escorted by a kind of rail-tank called a draisine. One such example was the 'Littorina' armoured trolley, which had a cab in the front and rear, each with a control set so it could be driven down the tracks in either direction. Littorina mounted two dual 7.92mm MG13 machine gun turrets from Panzer I light tanks. ^ "Summary -> Light Armor Armaholic". yousense.info. Retrieved 2018-11-25. ^ a b Edward John Barrington Douglas-Scott-Montagu Baron Montagu of Beaulieu; Lord Montagu; David Burgess Wise (1995). Daimler Century: The Full History of Britain's Oldest Car Maker. Haynes Publications. ISBN 978-1-85260-494-3. ^ Macksey, Kenneth (1980). The Guinness Book of Tank Facts and Feats. Guinness Superlatives Limited. p. 256. ISBN 0-85112-204-3. ^ Tucker, Spencer (1999). The European Powers in the First World War. Routledge. p. 816. ISBN 0-8153-3351-X. ^ Gougaud, Alain (1987). L'aube de la gloire: les autos mitrailleuses et les chars français pendant la Grande Guerre, histoire technique et militaire, arme blindée, cavalerie, chars, Musée des blindés. p. 11. ISBN 978-2-904255-02-1. ^ Bartholomew, E. (1988). Early Armoured Cars. Bloomsbury USA. pp. 4–5. ISBN 978-0-85263-908-5. ^ a b Franklin D. Margiotta, ed. (1996). Brassey's encyclopedia of land forces and warfare. Brassey's. ISBN 1-57488-087-X. Retrieved 19 February 2011. ^ Stanley Sandler (2002). Ground Warfare: An International Encyclopedia, Volume 1. ABC-CLIO. p. 59. ISBN 1-57607-344-0. Retrieved 5 April 2011. ^ Chris McNab, Hunter Keeter (2008). Tools of violence: guns, tanks and dirty bombs. Osprey Publishing. Retrieved 6 April 2011. ^ Bradford, George (2010). 1914-1938 Armored Fighting Vehicles. Stackpole Books. ISBN 9780811705684. ^ "The Propeller-Driven Sleigh". SelfSite. 26 July 2005. Retrieved 11 September 2008. ^ Franklin D. Margiotta (1996). Brassey's Encyclopedia of Land Forces and Warfare. Brassey's. pp. 56, 57. ISBN 1-57488-087-X. Retrieved 21 May 2011. ^ "Mexico police seize 'narco-tank'". 22 May 2011 – via www.bbc.co.uk. ^ "'Narco tank' is latest find in cartels' armored vehicles". 25 May 2011. ^ Fletcher, David (2001). The British Tanks, 1915-1919. Crowood Press. p. 149. ISBN 1-86126-400-3.